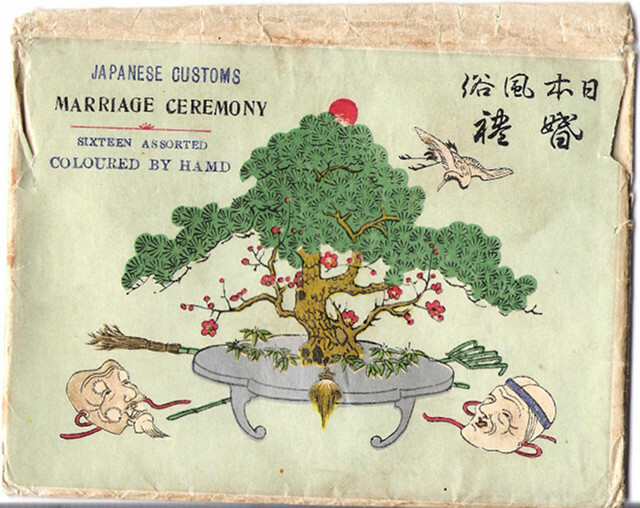 I was recently shown a shown a set of photographs illustrating Japanese marriage customs, covering everything from the formal introduction of bride and groom prior to an arranged marriage, to taking the couple’s baby to be blessed at a Shinto shrine. As they give an interesting insight into wedding customs and the traditional view of marriage in Japan, I decided to make them available here, along with the captions supplied with the original set of photos. I don’t have any information about when they were produced, but I would guess they date from early in the twentieth century, although many of the customs survive to the present day. If you are able to suggest a more precise date please let me know. Finally, I’d like to express my gratitude to Wendy Hutchinson, whose photos these are, for allowing me to make them available on-line. Any of these images may be reused under the terms of the Creative Commons Attribution 3.0 Unported Licence. If you use a photo online you must link to this page. For offline use please credit http://www.UnmissableJapan.com/ Clicking on the images will bring up a larger view.